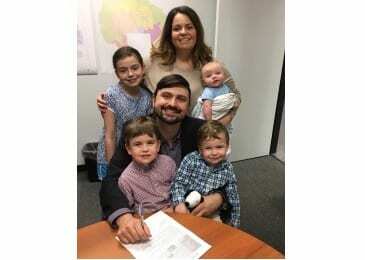 On Wednesday, Ryan Nawrocki officially filed to run for Baltimore County’s Sixth Council District seat which is located in eastern Baltimore County. Nawrocki has been endorsed by Gov. Bob Ehrlich, Congressman Andy Harris, former Baltimore County Executive Roger Hayden and former Baltimore County Councilman Wayne Skinner in his run for this seat. The son of a working-class family, Nawrocki says he learned the values of hard work and determination from the examples his grandfathers set as a World War II U.S. Navy Veteran and a World War II airplane builder at the Glenn L. Martin Company in Middle River. These values served Nawrocki well as the first person in his family to graduate from college. They also served the community well as Nawrocki was the youngest appointee in the administration of former Gov. Bob Ehrlich, a communications director for Congressman Andy Harris, and later helped to modernize one of the largest state agencies in Baltimore as a part of the Hogan Administration. Nawrocki also recently created his own small business – a communications and marketing firm. “Over the last eight years, the County has not focused on the needs of our communities, schools are overcrowded and crime is increasing. Ryan Nawrocki is someone who will deliver solutions to these critically important issues. That is why I’m endorsing Ryan for Baltimore County Council,” said former Baltimore County Councilman Wayne Skinner. Nawrocki says he is dedicated to common sense solutions that will change Baltimore County government. Ryan and his wife, Lauren, live in Middle River with their daughter, Emily, and sons, Matthew, Luke, and Jacob. Lauren is a nurse practitioner. Nawrocki recently completed his master’s degree in public management at Johns Hopkins University. For more information visit www.RyanNawrocki.com.